Using our CPI boost rules, you can improve targeting of your promotion campaigns. 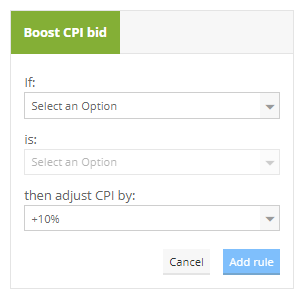 The CPI boost rules let you increase or decrease your CPI bid for specific users. In this way you can bid more for users that matter to you, and bid less for users that are worth less than average. How do the CPI boost rules work? 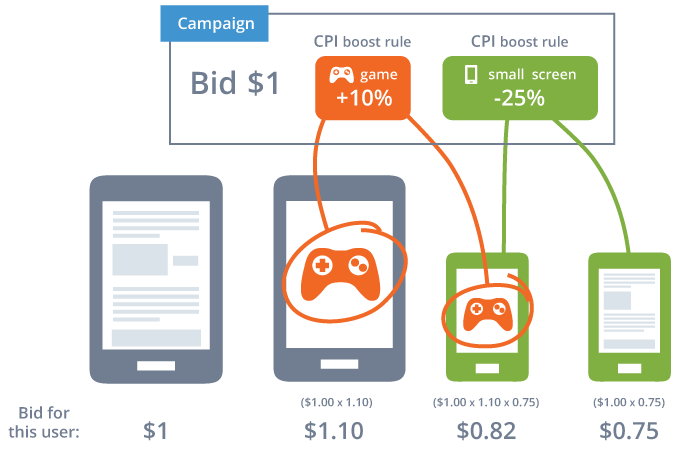 You can increase or decrease the CPI (cost per install) bid in your campaign settings for specific types of users. This increase or decrease applies to your original bid for each country in the selected campaign. 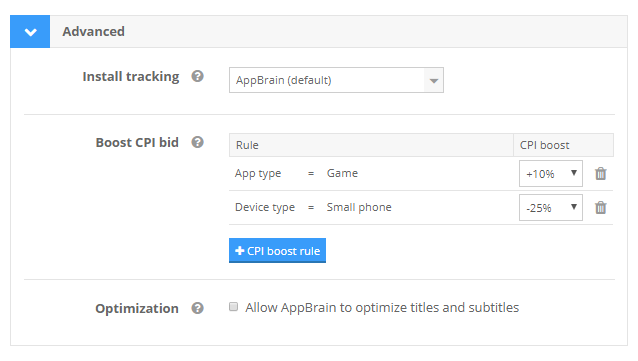 For instance: if you bid $1 for an install of your app, a CPI boost of 25% will result in a bid of $1.25 for the defined types of users. A CPI decrease of -50% would result in a CPI bid of $0.50. Device Android version: this rule applies to users whose device runs a certain version of Android. Users of an app type: a rule of this type applies to users using either an app or game when he sees your promotion campaign. Users of apps within an app category: a rule of this type applies to users who are using an app in a particular Google Play category when they see your promotion campaign. Device age: this rule applies to users whose device has a certain age (<1, <3, <6 and >6 months), based on the earliest installed app on the device. Device brand: this rule applies to users whose device has a certain brand (e.g. Samsung, Huawei, etc.). Device type: this rule applies to users of a particular category of device (small screen phone, phone, tablet). Device network speed: this rule applies to users who are currently connected to the internet with a certain network type (e.g. Wi-Fi or mobile network). Device language: this rule applies to users whose device is set to a certain language. How is the CPI bid calculated? Different boosts may apply to the same user. For instance if you set a boost of +10% on games, and also a boost of -25% on small screen phones, and your CPI bid is $1.00 in the country of the user, the CPI for a user who is using a game and has a small screen phone will be $0.82 ($1.00 × 1.10 × 0.75 = $0.825). This stacking behavior doesn’t apply to different rules from the same CPI boost type. For example, a CPI boost of 10% for Android 7 and higher, and a CPI boost of 25% for Android 8 and higher, will simply result in a device running Android 8 getting a boost of 25%. The CPI bid can not be boosted higher than 2 times the original amount, and can not be boosted lower than the minimum CPI bid of the country. For example, if you have an original bid of $1 for the United States and there is a negative boost of 50% applied to a user, the new CPI bid for that user will not be $0.50, but $0.80, as this is the minimum CPI for the United States. Go to your campaign setup and click the advanced panel to open it. In the advanced panel, click on the “+CPI boost rule” button. In the following popup, choose from the first dropdown menu any of the types of users where you want to increase or decrease the CPI bid. Then select the value you want to use for each of these types of users. Finally, choose the amount you want to increase or decrease the CPI bid and press “Add rule”. Your new rule is then added to the list of rules that are active for your campaign. The rule will be active for your campaign within 5-10 minutes after saving the campaign. Editing an existing CPI boost rule can be done by changing the dropdown with the CPI boost factor for an existing rule and then clicking the “Save” button. The trash icon next to the existing rules let you remove a rule altogether. Interested in advertising your app?